The Common Core’s language standards can seem overwhelming—students need to learn specific, complex grammar rules at each grade level. The Common Core Grammar Toolkit to the rescue! 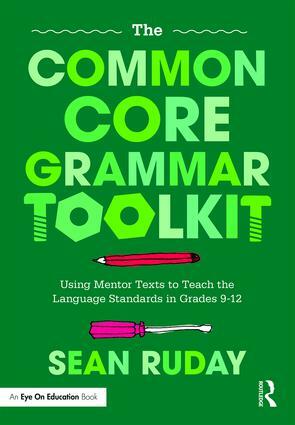 In this comprehensive guide, author Sean Ruday shows how you can make grammar instruction fun and meaningful. Teach the Common Core’s language standards for grades 9–12 by presenting each grammar rule as a useful writing tool. Use mentor texts—excerpts from great literature—to help students understand grammar in action. Promote metacognition along the way, so that students become responsible for their own learning. The book thoroughly covers how to teach the Common Core’s language standards for grades 9-12, on topics such as varying syntax for effect, using domain-specific words and phrases, analyzing nuances in word meanings, using semicolons to link related clauses, and more. You’ll learn how to present each of these grammar rules to your students as tools that will help them improve their writing. You’ll also find resources designed to provide you with extra support, including reproducible classroom-ready charts and forms, an annotated bibliography of suggested mentor texts for each grammar rule, and a guide for teachers and administrators interested in using the book for group-based professional development. With The Common Core Grammar Toolkit, you’ll havea clear game plan for encouraging your students to use language more purposefully and effectively. Introduction What Should High School Grammar Instruction Look Like? Sean Ruday is an associate professor of English Education at Longwood University and a former classroom teacher. He is also a Co-President of the Assembly for the Teaching of English Grammar. He frequently writes and presents on innovative ways to improve students' literacy learning.